Have you ever wondered why your feet smell, even during winter months? While you might think excessive sweating or foot odor should be something you only have to deal with in summer, there are a number of things that can contribute to smelly feet in the winter. Today, William F. Buffone, DPM of North Fork Podiatry and Three Village Podiatry is sharing some causes and cures for sweaty feet, otherwise known as Hyperhidrosis. A change in the weather. Any change in the weather can trigger excessive sweating. It’s a process called autonomic regulation and it occurs when your body has to work overtime to tolerate these changes. Fluctuations in temperature. Fluctuations in temperature - such as when you return indoors after walking in the snow - cause your feet to have to work harder to control the temperature and in doing so, they perspire. The shoes you choose. In winter, you usually wear warm boots or non-breathing footwear like insulated or rubber boots and waterproof footwear. When your feet are enclosed, bacteria thrive, and they can’t air out. Layering thick socks. While wearing several pairs of socks can keep your feet toasty and warm, it also locks the sweat in, leading to foot odor. Also, wearing multiple layers of socks can cause friction and pressure and corns or calluses can develop, which may also add to excessive sweating and odor. Dry skin. Because the air is drier during winter months, our skin tends to dry out more quickly, and the dead skin provides food for the bacteria that can trigger smelly feet. 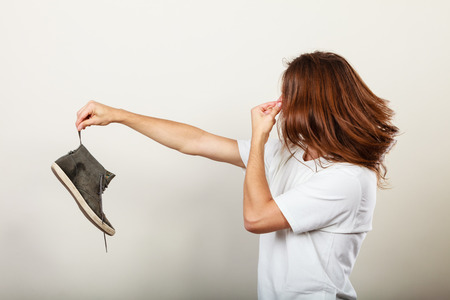 There are a number of things you can do to avoid foot odor this winter. Remove your warm boots as soon as you’re back indoors, so they can air out to avoid overheating of your feet. To make sure that the footwear you wear one day dries completely, switch to a dry pair the next day because moistness equals more bacteria. Be sure to change your layers of socks often if you tend to sweat a lot and wear socks that will wick moisture away, keep your feet cool and neutralize odors. Exfoliate your feet using a pumice stone, dry brush, or loofah to remove dead skin cells from the top layer of the skin to keep your feet clean and odor-free. Wear breathable footwear to give your feet a chance to air out. (631) 474-3338, North Fork Podiatry (Southold) at (631) 765-6777 or North Fork Podiatry (Riverhead) at (631) 419-7107 today to schedule a consultation.